In 2005, Joyce Yang became the youngest ever medallist of the Van Cliburn International Competition, and in 2010 she was awarded the Avery Fisher Career Grant. She now makes her recording debut for Avie with a collage of a programme that ideally represents her artistry. 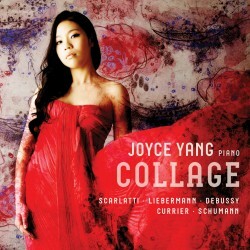 Joyce chose pieces that illuminate each other in arresting ways: Sebastian Currier’s Scarlatti Cadences reflect the repetitious melodic motifs of Scarlatti’s Sonatas, Lowell Liebermann’s Gargoyles echo the esoteric timelessness of Debussy’s Estampes, and Liszt’s transcription of Chopin’s song My Joys opens a window onto Schumann’s Carnaval. These works are an aural autobiography of Joyce’s first 20-some years of music making, and also portray her unique brand of synethesia, the visualisation of music in shapes and colours. Appropriately, the repertoire Joyce chose for this recording is inspired by vivid imagery, and the striking artwork is the result of collaboration with artist Joan Snyder, whose colourful paintings are featured throughout. Joyce performs with such orchestras as the New York and Los Angeles Philharmonics; Chicago, San Francisco, Baltimore and Houston Symphonies; Philadelphia Orchestra and BBC Philharmonic, with such conductors as Edo de Waart, Lorin Maazel, James Conlon, Leonard Slatkin, and David Robertson. In recital Joyce has appeared at Lincoln Center’s Alice Tully Hall, the Metropolitan Museum, the Kennedy Center, Chicago’s Symphony Hall, and Zurich’s Tonhalle. An avid chamber musician, she is a recurring guest at the summer festivals in Aspen, La Jolla and Santa Fe. Born in Seoul, Korea in 1986, Ms. Yang moved to the United States in 1997 to study at the Juilliard School where she graduated with honours. A Steinway Artist since 2008, Joyce resides in New York City.